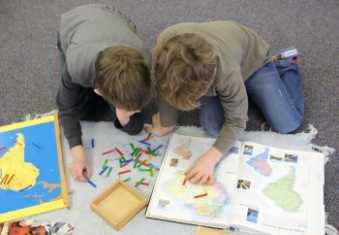 Petoskey Montessori Elementary School's classroom allows children to respond to lessons eagerly when they are able to see and explore connections between everything they are actively learning. Their engagement is reflective of how the world, in general, operates. The best thinkers - CEOs, artists, activists, peace-brokers - are all good at what they do because they see how things are interconnected and interdependent. By seeing the whole, children are better able to understand their role, how they fit in and what their contribution can be. Our objective is to provide a carefully planned, simulated environment which will help our children develop within themselves the fundamental habits, attitudes, skills, and ideas which are essential for a lifetime of creative thinking and learning. Beginning the day with a welcome handshake on arrival, children learn traditional values such as grace, courtesy, and respect for others along with strong academic principles. Our classrooms are designed around the developmental aspect of self-teaching activities presented with specific instruction, and, at times, elaborate ceremony. It is a privilege, both for the child and the adult, to be able to work with such time-tested materials offering key learning experiences for each child. • Integration of the arts, sciences, geography, history, and language that evokes the native imagination and abstraction of the elementary child. • Presentation of the formal scientific language of zoology, botany, anthropology, geography, geology, etc., exposing the child to accurate, organized information and respecting the child’s intelligence and interests. • Presentation of knowledge as part of a large-scale narrative that unfolds the origins of the earth, life, human communities, and modern history, always in the context of the wholeness of life. • Emphasis on open-ended research and in-depth study using primary and secondary sources (no text¬books or worksheets) as well as other materials. After School - 3:00 - 5:30 p.m. The following forms are needed to apply for admission into the elementary program. If your child will need before or after school care please fill out the latchkey contract as well. If you do not reside in the Petoskey School District a School of Choice Form must also be completed.